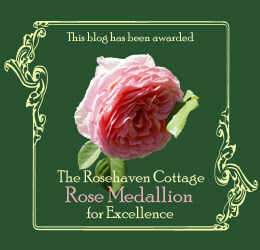 We are pleased to award another Rose Medallion for Excellence. This time the award goes to Kari and Kijsa and their blog Ask Kari and Kijsa. For those that love beauty, a visit to Kari and Kijsa's blog will be a treat beyond description. The two sisters have created a gem of a blog with a gorgeous layout, aesthetic, and look. It is so appealing to Cindy's fellow designer's eye that she often likes to go and just look at it like a favorite book. But great design can't stand on its own without soul and heart--which their blog just exudes. We cannot even find the words to describe it adequately. Go visit their blog and you'll see what we mean! Gorgeous choice for your award. Thanks for telling us about their blog.